by Brimley, Vern, Jr.; Verstegen, Deborah A.; Garfield, Rulon R.
Dr. Brimley was a student of Professor Percy Burrup and did research for the first edition of Financing Education in a Climate of Change and was co-author of the third edition with Professor Burrup. He teamed with Dr. Rulon Garfield after Dr. Burrup’s death to write the fourth through eleventh edition and with Dr. Deborah Verstegen as co-author for the eleventh and twelfth edition. Dr. Brimley served as an Adjunct Professor at Brigham Young University and has taught many education leadership courses, but specialized in school finance and school business management. He has presented papers at conferences including the American Education Finance Association and has written articles on various education issues. He is married to Dawn Baker Brimley. They are the parents of three daughters and have ten grandchildren. Deborah Verstegen is a Professor of Educational Leadership, College of Education, University of Nevada, Reno. She served as Edwin J. O’Leary Chair of Financial Management, University of Illinois, Urbana-Champaign in 2006-07 and was a professor in finance, policy and leadership in the Curry School of Education at the University of Virginia for nearly two decades. Prior to joining the university community in 1984, she was a teacher, administrator and legislative aide in state government. She has had teaching experience at all levels, from pre-school, elementary, secondary, and community college, to university, at the graduate level. Her administrative experience in education is also broad. She has been a central office administrator for a K-12 school system in Alaska's Iditarod Area School District--which is approximately the size of Ohio and includes 14 schools and two preschools--Director of the Mid-management Program at the University of Texas at Austin, and Department Chair at UNR. She has worked in government as a legislative aide in Wisconsin's House of Representatives and as a lobbyist for the nonpartisan League of Women Voters of Virginia in the Virginia General Assembly. She was named Distinguished National Fellow in Finance in 2011 and developed an equity statistic, later named the “Verstegen Index” by scholars. Dr. Verstegen is actively involved in several professional associations and currently she serves as an Education Policy Editor for the JEF and serves on the Board of Advisors for the National Education Finance Conference. Currently, she is a tenured professor at the University of Nevada teaching graduate and undergraduate classes. Rulon Garfield, Ph.D., has a distinguished history in educational finance. As full Professor of Educational Leadership he sat in the finance-economic-policy chair at Brigham Young University formerly occupied by the late Percy E. Burrup. Just prior to accepting this position he was Director, Management Consultant Services, Coopers and Lybrand, assisting in finance and business administration issues for local districts, state departments of education, colleges and universities. He has been a Presidential Appointee of Gerald R. Ford as Chairman of the Federal Regional (VIII) Council; Regional Director (VIII) Department of Health, Education and Welfare; Lead Regional Director of Finance and Management, Lead Regional Director for Education, HEW; State Senator, serving on the Education and Appropriations Committees. His service included that of being a teacher in elementary school, junior high, high school, community college, college, university—undergraduate and graduate. As an educational leader at the elementary, secondary, district, state, and national levels he has had to solve many practical problems in educational finance. When chosen as an American Political Science Congressional Fellow, he served as a Legislative Staff Assistant in the United States House of Representatives and in the United States Senate as a Special Staff Assistant to the vice President of the United States. He is the author of numerous articles and three books, a speaker at national meetings and state conventions on educational finance. 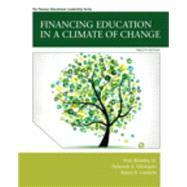 Dr. Garfield co-authored the fourth through the 10th editions of Financing Education in a Climate of Change with Dr. Vern Brimley and with the addition of Dr. Deborah Verstegen for the eleventh and twelfth edition. What is the Cost of an Adequate Education? Finance Reform or Tax Reduction?